Our parent company Kasahara Industry Co. has many years of experience serving the Japanese automotive industry. KB Foam is looking forward to following in Kasahara’s footsteps by becoming a reliable option for car manufacturers in Mexico and the United States in the near future. The expandable resins available at KB Foam are optimal for manufacturing automotive components. KB Foam is capable to molding cushions of the highest quality, from EPS to Hybrid materials, which provide light weight, low cost, dimensional stability, design versatility, and optimal energy absorption. 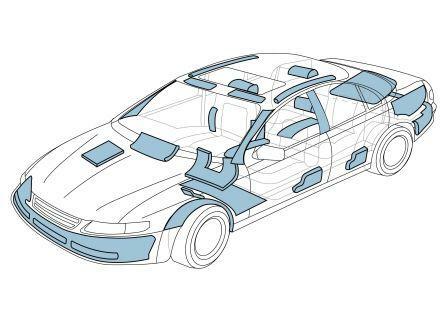 Depending on the needs and purpose, several kinds of foam cushions can be used in automotive applications. These parts include core bumpers, floor spacers, leg protection pads, tire spacers, panels for side impact protection, head rests, and sun visors among other components.